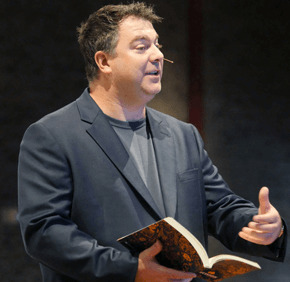 SEVERNA PARK – According to Matthew Kelly, no group of people is in a better position to change the world than Catholics. Kelly, originally from Australia, is the president and CEO of Dynamic Catholic, a publishing company that creates catechetical materials for adults and children. His message for the day was one of personal conversion, and it contained a challenge for active Catholics: Reach out to the disaffected of the faith, especially young people who fall away from Catholicism after receiving the sacrament of Confirmation, and disengaged Catholics who only attend Mass on Christmas and Easter. One way parishes can do this, Kelly said, is to “bring catechetical moments into the 21st century” by moving away from “heavy textbooks” and their connotations of hard work, and using more multimedia and video content at retreats and in class. One of those 21st century catechetical moments happens every Christmas, but Kelly said that Catholics rarely recognize it. Since some Catholics only come to church once or twice a year, he explained, it is important for parishioners to pay attention to them. Another place for Catholics to start the process of reinvigorating the church, Kelly said, is to further engage with their own faith. He recommends attendees either read the Gospel for 15 minutes a day for a year, go to confession regularly, or keep a Mass journal. “When we listen to the voice of God in our lives, we get focused, energized and invigorated,” he said. Matthew Kilmurry, a parishioner of Our Lady of the Fields in Millersville, is a coordinator of the pre-Cana program there. He said that marriage preparation is one of the other moments when active Catholics can successfully reach out to the disaffected. Jessica Rivera, a junior at Mount Saint Mary’s University in Emmitsburg, came to the event with her mother and two sisters. She was impressed by the packed house.